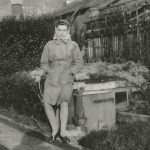 Enap Espie was a young girl in Brandon during WW2 and recalls life in the town. 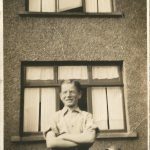 I was born in 1929, at my Great Grandfather’s house at 10 London Road, Brandon, and then lived with my parents at my Grandmother’s home at 24 London Road until my parents bought a house at 11 Church Road, Brandon. My sisters and me were the only children living in the road at the time because most of the other people living in that road were business people and quite a lot older. I spent most of my time at my granny’s house as my mother always had lodgers, but then the war started in 1939 and that changed things for us. I remember that we were away on holiday when that happened and we came home very quickly upon hearing the news. My sisters were away too and my mother panicked and rang my second sister, who was in London with an aunt, and my other sister, who was in Stowmarket with my other granny, and told them both to come home. There was a shop in Thetford Road, and sometimes on a Sunday afternoon he would sell sweets and if you were lucky after queuing for ages you would get some, but half the time you would get them they would be mouldy, and how long he had kept them I don’t know. He was a friend of my father. Then the Barnardo boys came to Brandon. Now some of them were a bit naughty, but I think people made out the Barnardo boys were worse than they actually were. I didn’t see anything bad happen. My sister was friendlier with the boys than the girls and used to bring some home from school at dinner time and I remember one occasion when my sister brought home a black boy one day. My mother saw this coloured boy, who had found the axe we used for chopping firewood, and he was doing some sort of war dance with it. She almost had a fit! Of course he was only messing about, but he was the first coloured boy we had ever seen, and I think he was the only one with the Barnardos boys at Wangford. I became really friendly with one Barnardo Boy and his name was Dennis Mathews. My friend and I would bike to Wangford to see if the boys could get out of the Hall. We were about 13 then and I know it sounds silly but it was a different era then, we could cycle safely for miles without seeing any traffic. They would be allowed out on a Saturday for the cinema, so we would go to the cinema on a Saturday and see if we could sit next to a couple of the lads we knew. What happened to them after the war I don’t know and I often wonder what happened to them. Dennis gave me a diary as a present.Evacuees – When the evacuees came to Brandon the authorities were going to keep some at my granny’s but she was in her 70s and it was not a convenient place to keep them and so the family said no as she wasn’t too well, and as it happened she died in 1942. The evacuees fitted in alright after a time. My mother had workmen lodging before the war and during the war she had troops billeted at the house and we received many Army blankets, which were accidentally left behind by the troops. There is one soldier that I remember, a Lieutenant I think he was, who married the newspaper shop owner Betty Green. 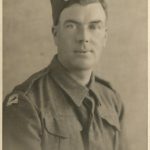 I have a photo of another one of them; he was in a Tank Regiment I think, his name was Tom Squires, from up North somewhere. 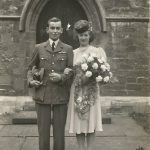 Then I remember that we had a Royal Air Force airman staying with us who I think served I at R.A.F. Feltwell. We had a music teacher live with us after the troops had moved on. She was Mrs Frow (Froud?) and she taught at Brandon. She had broken her arm sometime before she came to us and it had never set properly and the children would take the ‘mickey’ out of her twisted arm. My mother would often laugh when Mrs Froud (?) would say “Can I start at the cakey end?” which meant she wanted to eat cake first before eating the main meal. One day Mrs Froud (?) asked if she could have a piano in the house, but my mother said there was no room for it, and so my father converted one end of his shed into a music room for her so she had the piano in there. He added a fire for her for heating, although it probably would not be allowed nowadays due to fire regulations as the shed was made of wood. My father would have his tools at one end and she would be at the other end and what happened to her I don’t know, she left before the end of the war. I left school in 1943 and started work at a Grocer’s shop which I think it was called Statham’s, and was where the bank is now … and I hated it! The shop was overrun with rats and each morning someone would probably want a bag of flour, which was kept in barrels, and I would have to brave the rats to weigh the flour. From there I got a job at Greene King in Bury St. Edmunds, and at that time Greene King never usually employed women but because of the war they could not get the men to fill the job vacancies and so they had to take on us women, and that was only a temporary position until the men came back from the war.Air Raids – Incidentally, machine gun bullets hit my granny’s house when a German plane attacked the school. We had been in the cookery room that day and after we had gone home for dinner we got back and they told us the ceiling had been hit. We were at home and saw the plane go over from our window and it was going down the London Road. We didn’t see any firing but he was fairly low. While we lived at Church Road my father made us a homemade bomb shelter in the back garden, which he dug out and reinforced with iron bedsteads and concrete. He dug it out very deep and even added a chimney for heating on cold days but we only used it once if I remember correctly, and as kids we used to play in it as it made a nice playhouse and lit a fire to cook food. One night there was an air raid at night and my mother was out at a whist drive at one of the military camps and my father got called out as he had duties with the ARP. He put us down the shelter on our own, as there was no one at home, but I don’t think we were down there that long. Usually mother would put us into the cupboard under the stairs. I think we had mattresses in their too and there was plenty of room for us three girls. Sometimes we would bang on the wall to make sure the lady next door was okay, as she was quite old, and we would shout “Are you alright” and she would reply “Yes”. That is how we made sure she was okay. I think in the end we would get used to the air raid warnings so that we would not bother getting out of bed. We had a landmine drop at the top of Rattler’s Road near the asparagus field, now we did hear that one. When I was at Bury, I enrolled into the Girls Air Training Corp, but we didn’t do anything spectacular apart from drilling on the school playing field and we would also have to draw aircraft so we could identify them, but I could not draw very well so I could not get any of them correct. Of course when I came back home I had to leave the group. I was on my way to work at Calders that day when someone told me I might as well go home, as that day had been declared as a holiday. Some of the Brandon boys thought they would make it a night to remember and so they went to the ammunition dump at Santon Downham and ‘obtained’ some firecrackers and proceeded to let them off on the Market Hill that night. Dear me did they make a noise!My mother got me another job in Brandon, at Calders’ (wood yard) office, before the end of the war. She got me the job but the trouble is I didn’t want to come back home as I was having too much fun in Bury and there was more life in Bury than there was in Brandon and I had made several friends there. The man at Calders told me to go home and think about whether I wanted to work there or not, and so when I thought about it I realised that when the men came back home from the war I would be out of a job at Greene King, so I took the Calder’s office job, which I kept until I got married in 1950.